Thinkspace Projects is pleased to present Betwixt and Between featuring new works new works by Canadian artist Sarah Joncas and Southern Californian artist Kelly Vivanco. Both artists are known for their narrative-based works that embrace the imaginative potential of the subconscious and creatively play with elements of the surreal drawings on feelings of nostalgia whether it be hopeful or melancholy. 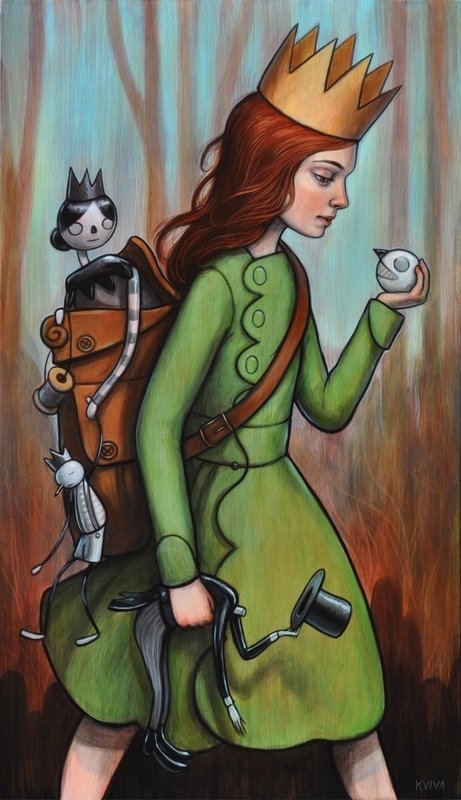 In anticipation of the exhibition opening, Saturday, January 6th, our interview with Kelly Vivanco shares her insight about growing as an artist, favorite fable, and plans for 2018. KV: It’s hard to tell if themes come before a show or emerge during sketching and painting the pieces. Months before, I look through my collection of old photographs, random art-crafts-animal-birds-picture books and an ever-growing mass of odd bits I’ve dredged from the internet. It sits up in my noggin’ and slowly tangles, making connections and snarls like a hoarder’s dreamcatcher until I start to paint. Atmosphere, feeling and theme comes out then. Like I said, I can’t tell if it comes before or during — it’s very chicken and egg. KV: A lot of my favorite fables teach you things like — all stepmothers are evil, grandmothers should shave lest they be confused with wolves, or a prince’s kiss is an approved method of CPR. Others teach a more general — treat people how you’d want to be treated, which is a great message. I don’t try to add any story or message to my paintings, even though my pieces can appear illustrative, it’s up to the viewer to add their own interpretation. KV: The best part — getting totally lost in creating, losing track of time and space and everything. Losing who I am and all my fears and worries. The worst part — letting my fears and worries get to me afterward, second-guessing everything I’ve done, looking at other peoples’ work and success and judging myself in comparison. I guess that’s not strictly part of the creative process, but it is part of the process of putting something out there. KV: Where the subject is situated is important to the whole painting, whether she is at a Dodger’s game or in a box comforting Schrodinger’s cat or in a lush garden, it changes the view of who she is. But it goes both ways, she is viewed in the context of where she is, but also her environment is viewed in the context of who she is. SH: The girls in your paintings have a very wide-eyed childlike quality to them, what are the values and ideals they’d carry by the time they grew to be women? SL: I just hope that they keep their wonder even through everything it takes to grow into a woman these days. SH: When painting are you listening to music or podcasts? Can you share what you’ve been listening too? SL: At the beginning, at the critical stage, when I am trying to get totally lost in the pieces, I listen to music, like — Boards of Canada, Yppah, Tycho. I also listen to movie soundtracks, like — Thomas Newman, The Neon Demon by Cliff Martinez or Ramin Djawadi’s Game of Thrones. Or whatever random music pops up on YouTube. When I’m finishing off the paintings, during the less creative stages, I listen to podcasts like The Bugle and TV shows that I can follow along without having to watch the screen. For me, some of these pieces will be inexplicably linked to The Office and Toast of London. SL: I think staying the same can alienate collectors and followers as much as changing too much. I’d like to grow as much as I can, evolving in a natural way. It’s easy to paint the same thing again and again and get into that kind of pattern, it’s a lot harder to push yourself beyond that. I guess that’s why they refer to it as “push yourself” and not “laze yourself” or “drool-on-your-snuggies-while-watching-repeats-of-storage-wars yourself”. I despair sometimes when I look at my body of work that I’m repeating myself — same girls and birds and orangutang, like everyone, is doing — but despairing is part of what pushes you to do something newer and better. KV: I always thought it would be cool to collaborate with a costume maker. I would like to see some of the clothing my characters wear come to life. SH: You sometimes create works with wood carvings or pieces that have a more sculptural element. Do you cut those pieces yourself or do you collaborate with someone to help create that vision? KV: I collaborate with my husband, Peter, on those pieces. He makes such wonderful panels for me to paint on and frames to finish some work off. He always does something that is complementary to the piece or something that inspires me. SL: A civilized day of croissants, coffee, reading or walking and exploring someplace new. SL: It goes from the gamut of a pretty thing that matches the couch to a mirror that really makes us look at how society is acting. There are artists like Josh Keyes doing that for the environment, or writers like Margaret Atwood that have been doing it for years — or the show based off her show — The Handmaid’s Tale. I think as people, not just artists we all want to change things for the better. Anything that makes us feel something or use our brains is a good thing. SL: I am curating an eight-by-eight show at Distinction art gallery in February and I have a solo show this November at Rotofugi in Chicago. Other than that I plan to play around with my grown-up version of a box of crayons and a pad of paper as much as I possibly can.